Inducting a new employee into your organisation is full of excitement for both the organisation and the new starter. There’s also a certain amount of administration that needs to be completed, and of course you never want to miss an opportunity to make a great first impression. How do you prioritise your induction processes? 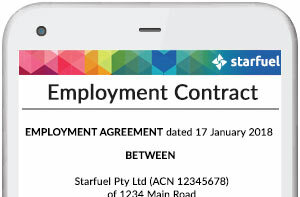 Is it about completing the employment paperwork in a timely manner, or giving your new starter the best transition into their new role? Is there a cultural focus in your organisation that needs to be communicated? Or multiple stakeholders who need to be updated on the induction process? Most likely it’s a combination of all of these and potentially more. Here’s some of the things you should consider when it comes time to review your induction process. We’ve put together a beginner’s checklist to help you get started on thinking about how induction and onboarding should work in your organisation. You can find a link to download a more detailed and advanced version below. Get a sample letter that you can modify to suit your induction process. 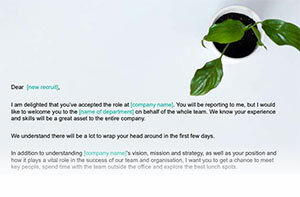 Your welcome letter works hand-in-hand with a welcome pack for new hires. But what should you include in a welcome pack? Automate welcome letters, compliance, forms, policies and contracts.